On our way back home the night of the No Data Tribeca loft party, Randy, Grellan and I stumbled upon the aftermath of some vodka launch party. The party was pretty much over with, though there were still a handful of bottles hanging around. I grabbed two and we ran down the stairs. 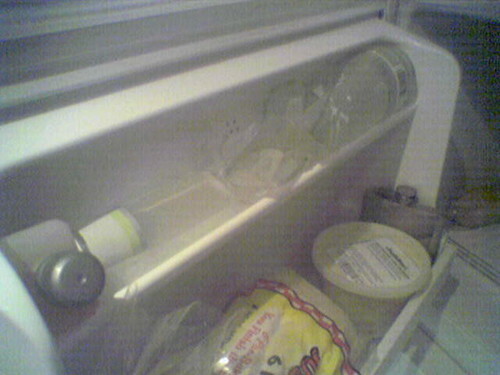 Late late later on, the bottle ended up in my freezer. Fast forward 10 days - I open my freezer to find that the vodka has broken, the bottle exploded. Glass covering my frozen pizzas and bagel bites. Huh.